Great Southern sea / tree change. We are thinking of a sea change from Perth to the Albany area. Anywhere around Albany. Not looking at moving imediately, just making some plans for the next 5 years. We would like to get a bit of land to do some intensive small agriculture and building work as I am a registered builder. Being a keen windsurfer I am keen to know the sort of areas most sailed around that area. I am mostly into bump and jump although my jump is more accidental. Not really into the waves or full slalomn, just out and back kinda stuff, ie not that fussy just like to sail. If there are peeps down there who can point me to good locations to sail then I would focuss our seaches for land in those areas. Not looking to buy in the towns, more kind of say 20km or so from albany. I dont mind a drive to get a sail in. There are a few sailors who sail down there. Western end of the harbor is a fantastic place for flat water and on the other side of the weed banks is choppy bump and jump stuff on the easterlies. Check out the GPS team challenge page and look for the albany posts. Coastal Speed Team & Mandurah Mob are regularly posting from there. Hi Skipd here's a couple of spots to get you started. Black Arrow - Harding Rd is where the GPS sailing happens in an Easterly. Weed fin is a must, can need quite small sizes as well during Summer as tide is lower, think 25cm and under. Yellow Arrow - Chipana Dr is often used in an Easterly by the B+J sailors. Find the Yacht Club and there are 2 houses just West of there, next to the 2nd house is a little area where you can park & rig. Probably still need a weed fin especially if staying on the bank which is a few hundred meters long before dropping off. White Arrow - Quaranup Rd can be sailed in Westerlys or an Easterly if the tide is high enough. Go past the Winding Rd sign & as the road straightens again there is a turn off to the left. If you have a 4x4 you can park on the sand if tide permits. You'll be rigging on sand, seaweed, gravel or road verge depending on conditions. You could probably also look at launching from the West side of the Entertainment Centre. That's just Princess Royal Harbour some guys sail in King George Sound if you want a more open water experience & Oyster Harbour is also sailable. If your looking for lifestyle blocks then Robinson is close to Town & Harding Rd or go a bit further out to somewhere like Elleker for bigger blocks. Bump and jump also sail at back beach, well they did 30 years ago. Best bet, is to let Morts talk you into wearing a GPS and see how fast you can go along the speed bank! Thanks heaps guys, I know those areas reasonably as I often visit my sister in Albany, have not taken gear down there yet as we are usually fully loaded, might have to take the trailer down next time and try get a sail in. Will check out those blocks?? 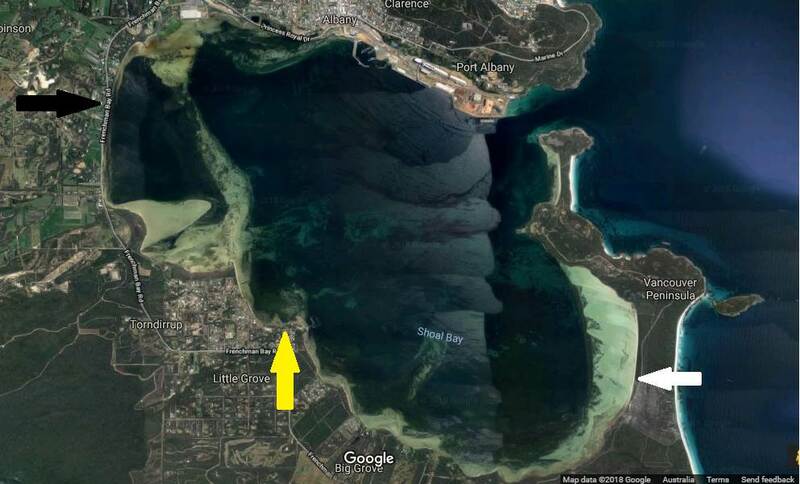 Looking for a lifestyle block up to around 20km out of town on the 'west side', then Robinson or Elleker would likely be the choice places not far from the most popular windsurfing spots around the harbour that morts mentioned, plus you could consider other nearby areas like Torbay, Marbelup, Cuthbert, Gledhow and Big Grove. You may also want to consider going out of town on the 'east side' around King River and Kalgan River towards Nanarup, around 15-20km out where there appears to be a lot of lifestyle blocks in these areas. Bit further to drive to the harbour spots mentioned, but also depends on whether you prefer to sail on flat to relatively flat water in the harbours, out in the ocean, or both. Hey GazMan, cheers, good to know there are plenty of ocean options. The inner harbour looks great for speed sailing but good to know there are options out of town as well. Looks like I could pretty much choose East or west of Albany and still get good sailing. My first choice would be be West of Albany so I am closer to Denmark for more building work options. East of Albany I think the population density would be quite a bit less for work opportunities. I think I need to be getting my kids some sailing gear soon so I can school them up so I have some sailing buddies, though I'm sure I'll hook up with the local crowd to sail with. Hitting up the open ocean down there solo must require an extra level of large knackers. The coast is so awesomely beautiful down there , very keen to hit it up when I'm down next. Does.anyone sail in King River? Looks pretty big? Are you local down there? OK I'm not the dude who started this thread but that's great info. My parents are in Mt Barker and I'm always wondering where to go in Albany. As in I've never taken any gear down coz I don't know where to go! Sounds like a great place to sail! Lilacs was fun today, water level a bit too low to get into the smooth stuff, runs down to 1km, but the chop was only 10cm or so in the worst bits. However a weedy is essential. I was running a 20cm @ 55 degrees and still feeling the weed. Yeah, sailing on the speed strip at the western end of Princess Royal Harbour is a real blast, though getting out anywhere on the harbours can be somewhat tide dependent at times, including Oyster Harbour which I suspect is what you're referring to as 'King River'? (both the King and Kalgan Rivers run into Oyster Harbour). I have sailed in that harbour but I'm often a bit nervous when trying to get up to speed in places where it's a bit shallow and I can't judge the depth!!!! Part of the reason why I prefer sailing in the ocean when the harbours have a lowish tide. Partner (now wife) and I did the sea + tree change + create new family move from Perth to Albany in 2001 and now couldn't imagine ever moving back! The amazing natural beauty of the area within 1-1.5 hr drive from home just takes our breath away every time we travel nearby! !